I’m not… entirely sure that the team who wrote, animated, and produced “McMystery At McDuck McManor” realize how truly bizarre this episode is. (Colleen Evanson, who penned the script to one of the show’s weaker outputs, helms this one as well.) 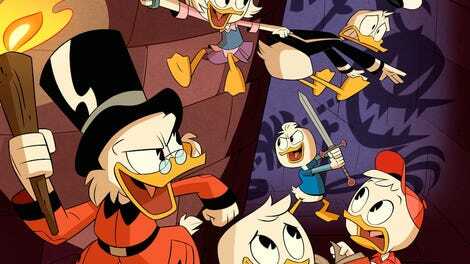 DuckTales, in any incarnation–comic series, old TV show, new TV show–is perfectly suited for the strange, to be clear. But in terms of all the actual “stuff” that happen in this episode, in addition to what we learn and how all of that is executed, this episode is a particularly strange outing. “McMystery At McDuck McManor” is at once bold in its revelations and frustratingly representative of a lot of the show’s current hiccups. I honestly have no idea how to truly grade this one, so it gets the universal, noncommittal B.
DuckTales is comfortable with its portrayal of Louie. It was a little wishy-washy with Dewey but seemed to have finally grasped his characterization with last week’s episode. But Huey seems to continually be a struggle. Ostensibly the character who’s obsessed with rules, organization, and structure–a classic cartoon characterization trope–DuckTales seems to want to try and push him to “comic” extremes. It’s clear with his nutty outburst in “The Infernal Internship Of Mark Beaks.” It’s clear in how he maintains his commentary composure in the midst of a horror show in “The Missing Links Of Moorshire.” And it’s clear here, with his commitment to maintain the party atmosphere, switching from his scheduled-to-the-minute hosting control to lead detective of a murder-mystery themed party when Scrooge goes missing. Despite Louie begging for Huey to take Scrooge’s disappearance seriously by calling for help, he submits to letting Huey maintain some structure of festivities, and it’s hard to say why. It’s a commitment that feels like it’s too much for the show, a bit too cartoony–a setup that feels more comfortable in something like Spongebob Squarepants or Unikitty. The episode tries to justify its approach character wise (Huey, with his control issues, is desperate to “win” Scrooge over by finding him, getting him to enjoy the party, and prove he’s better at parties than the deceased Duckworth), but it never really succeeds since the stakes are too high. It all just makes Huey look like a stubborn idiot. Yet here we are, in the midst of this mystery over which of the four guests did something to Scrooge, who utterly hates any celebration of his birthday. Had the episode not took a turn for the weird I probably would have pegged the “Scrooge kidnapped himself” angle way earlier, so there is some value in how the episode played to its genuinely creepy beats. Before the show’s now signature third-act turns, the murder mystery plays out through its guests, first with Nik Nokturne, AKA Black Arts Beagle, then with Ma Beagle, then with Mark Beaks, and finally, Glomgold. Glomgold’s accusation is executed as you expect, with funny, well-timed comic pacing that borderlines on making him a little too pathetic. DuckTales also continues to struggle with Mark Beaks: he’s either an online-brand obsessed Youtuber/Vine personality or a self-righteous tech venture capitalist, but can’t determine which side to really focus on. (I think it’s possible to do both with a character like Beaks, but as it stands it comes across very “Get Off My Lawn”-y with the low-hanging fruit-type gags thrown his direction, particular in a show whose target audience is a lot more savvy and sure-footed with online celebrities). Ma Beagle is the surest character, but also brings out one of the two most baffling scenes in the episode. I’m not sure how to take the reveal that Scrooge owns the land Duckberg is on and leases it to the town. Again, in a “cartoonier” show, such a revelation would be a pretty powerful satirical joke, akin to Rocko’s Modern Life’s “Conglam-O” (“We Own You”). But the episode spends a bit more time on this moment than a typical comic jab, adding the extra fact that Scrooge stole the land from Ma’s ancestor (hence why she’s in the mansion in the first place–to steal back the deed). I’m curious to the extent we should take this moment. Is it all a joke, just propped up with details to drive home the weirdness and darkness of it (one man owning the land and leasing it to the town is a point that requires a lot more fine-tuning that this episode allows, especially with Scrooge’s own criminal implication)? Or is this a narrative beat in the show’s overall story that’s worth paying attention to, something to remember down the line? I guess it can be both, but that kind of thing makes it feel like something out of Venture Bros.: narrative gags that become solid, detailed backstories and important plot points. DuckTales is… far from becoming that show. It isn’t even quite Gravity Falls yet, perhaps the closest comparison out there. I’m honestly wondering what you all think. The second bizarre revelation isn’t as bizarre narratively, but it does change a certain dynamic of the show. The third-act turn has Black Arts Beagle exposing his Dark Arts prowess, bringing back to life some demonic creature, who turns on his creator, then sets his sights on the nephews. He gives chase–classic DuckTales all the way here–until Huey realizes that Scrooge is behind it all (watching from his surprisingly small security room), only to then discover that the demon was, in turn, Duckworth brought back to the mortal world as a ghost. DuckTales doesn’t think this is a lot, but, boy, this is a lot. The fact that a dead Duckworth will now be floating around McDuck manor as a side-character is both weirdly dark and at once ridiculous, bordering on the shrugged logic that comprised those post-Scooby Doo cartoons about teenagers and a random additional figure, be it a talking shark, a talking car, or an actual ghost (parodied in shows like Mike Tyson’s Mysteries). I’ll give props to the show for at least presenting the idea as both creepy and yet all the more normal in this Duckverse, but I do wonder how younger audiences will take to these kinds of developments. DuckTales seems to love to subvert mysterious concepts by presenting them as not mysterious at all–sure, a little out there, but all part of the Way Things Are. The subversion is great on paper, but it’s automatically results in the stakes being deflated immediately. (It makes a sort of sense that the last three episodes either placed a lot of questions on the whole of adventuring, or presented a fairly straight-forward one, at least). 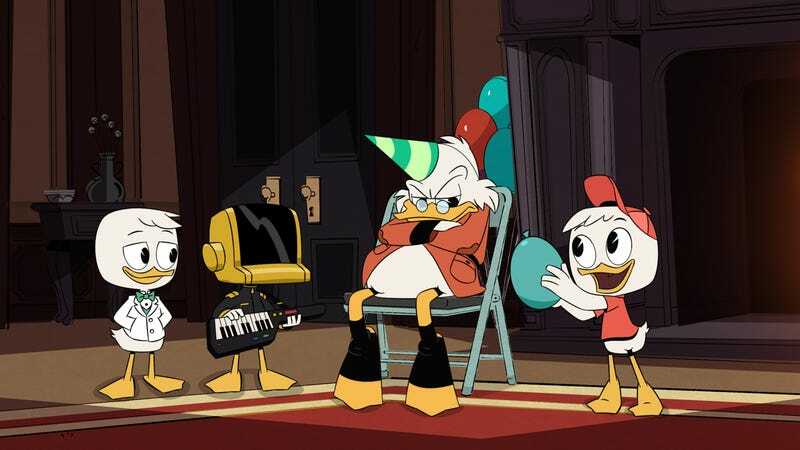 There’s something to be said about DuckTales going all out with how it’s telling stories, its commitment to being both curious, weird, and non-traditional. But this approach seems to be geared towards (trying to) maximize comic potential and less about weaving smooth stories, tackling themes, or making stakes really matter. (On a rewatch of this episode, I was struck by how clunky it came off, how forced it all felt, how most things happened just to make punchlines happen–not to mention it’s unclear why Huey would be jealous of some dead guy he never met.) I suppose it’s good that I honestly have no idea where the show is going after this, but I question if the show can do any idea with justice (or even logic) if they keep up this odd, cynical approach. Scrooge being amused by watching his nephews get scared to death while his butler chases them with a real axe seems particularly dark. I know that Scrooge doesn’t really like his nephews, and I know it’s part of DuckTales whole thing, but still. Speaking of which... maybe there’ll be more to this in the future but the idea of Duckworth coming back, and still maintaining his loyalty to Scrooge (to the point that he’s down for scaring children to death) is not quite the vibe you wanna put out there these days. Butler/servant characters have historically been winking, self-aware commentators of how ridiculous rich people are, and the original Duckworth was savvy enough to mention how crazy Scrooge was in his asides. This blind loyalty to Scrooge really removes agency from a character who, you’d think, would be doing a lot more stuff than returning to protecting and serving the richest duck in the world. It’s pretty tacky, DuckTales; man, read the room. At the risk of preforming the cardinal critical sin of discussing what an episode SHOULD have done, I wonder if it would have been stronger to just transform the narrative into the “murder mystery” trope without trying to justify Huey’s need to go into it. It wouldn’t have made “Hat” so frustrating to watch.